Updated for 2019: This is the newest version of the best-selling Drupal book. Clear instruction: Learn Drupal 8 by following plain English, clear visuals and enjoyable step-by-step instructions. Hands-on learning: Master Drupal 8 by building a complete Drupal site. Drupal 8 is an amazingly powerful web content management system. But many newcomers find it confusing, and most Drupal books are just too complicated to help. If you want to spend less time struggling with complex instructions, and more time building sites that make you proud, this is the book for you! Stephen Burge has taught thousands of beginners - and thousands more who've experimented with Drupal but haven't mastered it yet. Drupal 8 Explained requires absolutely no experience with Drupal, content management, website construction, programming, scripting, or even HTML. Please note: This book is 100% aimed at Drupal beginners. 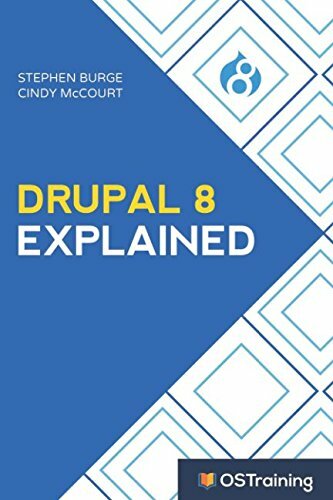 Drupal 8 Explained contains very little code, and that is absolutely deliberate. If you want to learn how to create themes or code modules, there are other books for you. You'll master Drupal 8 hands-on, through a complete case study, crystal-clear visuals, simple explanations, and on-target analogies, all extensively tested with real Drupal beginners. Just as you don't learn to ride a bicycle or drive a car by reading a book, you won't learn Drupal without working with it. So, throughout every chapter in the book, readers are asked to work with Drupal. By the end of the book, you will have a complete Drupal 8 site. Burge walks you through installing Drupal 8, planning sites that are easy to use and manage, adding content, and incorporating powerful site features without programming. Finally, Burge shows you how to run your site securely and efficiently, no matter how big or popular it becomes!